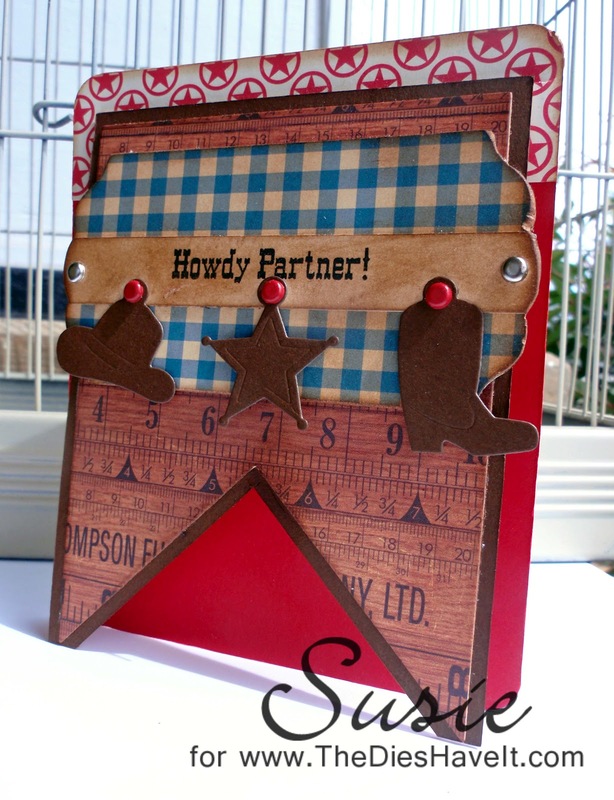 Created 4 Creativity : Howdy Partner! Here is my second post of the day and I am thrilled to show you this flap card that I designed using Joy's Life Stamps. The card itself is just a regular side fold card, but the magic is the flap. I designed the pennant with a hinge at the top that slips into a slit at the top of the card. So when I open the flap, I can stamp whatever sentiment I want underneath. I am just not sure yet what that will be, so I am waiting. Then on the inside of the card I can write a little note or slip in some cashola. It was super fun to design this. I used dies from both PaperTrey Ink and MFT Stamps. The sentiment is from the Joy's Life Lots of Puns Stamp set which you can find right here. I hope you've enjoyed this little card. Something different and something fun I think. I'll be back in just a little bit with one more post today. See you soon. Super cute! I love the western theme!